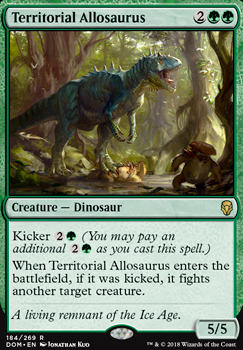 Why is territorial allosaurus illegal in Edh? 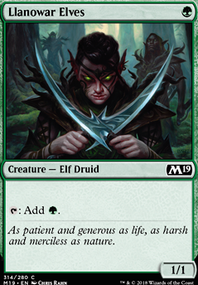 Goreclaw, Terror of Qal Sisma doesn't actually reduce the cost of any of your cards and would be better off as Territorial Allosaurus check out my mono-green deck for the next standard. The reason Tapped out thinks it is blue is because I am using Kiora, Behemoth Beckoner . I understand the reluctance to replace Knight. It's certainly not a dead draw, or anything. Just keep an eye on your 3 and 4-mana dinos as you upgrade the deck to make sure that the possibility of double-spelling outweights the extra mana presented by Dynamo. I think Territorial Allosaurus is worth it. You are light on targeted creature removal. For that reason, I like Domri Rade , although if you don't own a copy, I would put that money into Path of Ancestry and Regal Behemoth , first. I don't like Huatli, Warrior Poet . The dinosaur thing is cute, but this isn't a go-wide tribe like Elves or Goblins where a 3/3 token will make a difference to the board. 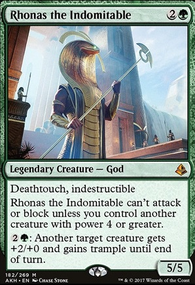 You want them in your deck for Gishath value, and that's the main reason. Think about Charging Monstrosaur , by comparison. You get 5 power with haste on the first turn it comes down. 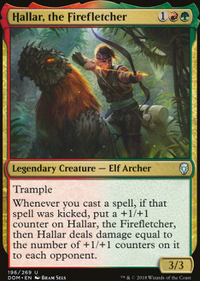 With Huatli, you get to attack with 3 power the second turn, and 6 power the third turn, assuming she survives, which is a rough task for Planeswalkers in multiplayer. If she does, it will take 6 turns of making and attacking with 3/3 dinosaurs every turn to surpass the damage output from Monstrosaur, and she's not a hit off Gishath. I'm not sure if that means you should run Monstrosaur or not, but Reality Smasher Jr. won me a lot of games of Draft. 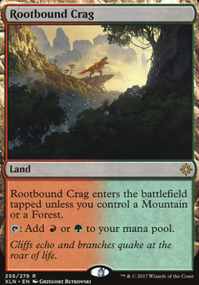 As for how to alter your ramp package to make it better, seeing Rampant Growth reminded me of an excellent article at EDHREC. Check it out, since I think Dana Roach does a better job explaining land ramp than I can. I would also go up to 39 or 40 lands. 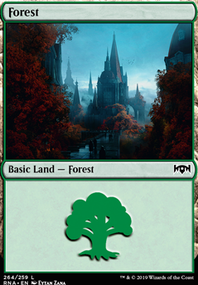 You REALLY want to be hitting your land drops with an 8-mana commander that your deck is built around, and one that's 3-colors, to boot. If you're afraid of flooding out, Scattered Groves and Sheltered Thicket aren't a bad compromise.